Some 70,000 years ago the oceans began to rise at a rapid rate, inundating coastal lands around the world, including Florida. This continued unabated over the centuries until about 5000 BC when the oceans stopped rising, allowing the Florida Keys to remain as land, but only a few feet above sea level. 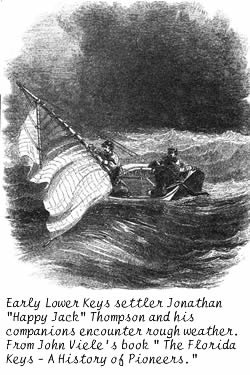 This is the Miracle of the Keys, and it is why Ramrod Key today is a low island, not a submerged reef. 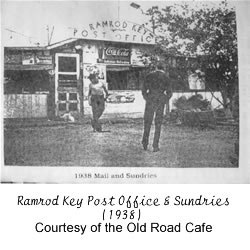 Our island was officially recognized by the name Ramrod Key in a Government survey in the mid-1800s. In June 1857, a survey report was filed by US Surveyor C.T. Iardella, who described Ramrod Key as covered with heavy mangrove, palmetto, sea grape and buttonwood with an outer shore of coral rock. The surveyor also noted a lagoon (salt pond) on the western side with depths of five to fifteen inches. By 1878, Ramrod Key was showing on Government charts. Long before our island was officially named and charted it was visited by Calusa Indians, but apparently occupied only as a refuge from the warlike Creek Indians, who were induced by English settlers to make slave raids on the Calusas. Finally, chased by the Creeks and decimated by European diseases, the remaining Calusas escaped to Cuba and were assimilated into the local population. Before the Calusas, there was probably a small population of other Indians occupying some of the Keys islands but there is very little evidence. The only known prehistoric physical signs of previous occupancy of our BBECA subdivision were remnants of a “native rock” wall near the southeast point of Ramrod. An old-timer reported that there was once a pig farm there. In the late 1800s and early 1900s, the Lower Keys were sparsely populated, mostly by sponge fishermen and others living from the sea. They lived in primitive conditions – driftwood shacks with palmetto thatch roofs – and supplemented their diets with venison (Key Deer meat). Over the years, small communities would form and then vanish to be replaced by others. Some people came from south Florida but many others from the Bahamas. The 1870 census listed 3 families on Ramrod Key, with a total of twelve people. The 1910 census again listed 3 families, now with 11 people, none of whom carried the same names as in 1870. The 1935 census listed only 3 people, again all different names. Apparently, Ramrod was a hard place to eke out a living. In spite of our low population, a Post Office and general store was established here in 1917 and remained open at least until 1938. It was located on the higher ground just west of the present location of the FKAA pumping station. Most Ramrod activity in all the years before 1957 appears to have been centered on this ridge area where both the old auto road (1928) and the railroad (1912) crossed the island. But the train didn’t stop at the Post Office; it merely hooked a suspended bag of mail as it roared through. There was one not-to-be-forgotten resident of Ramrod in the early years (at least until 1960) who lived in a small house in the woods somewhere. Her name was Nellie Shanahan and she was called by one writer “the pioneer woman” of Ramrod. Nellie embraced “Irish Mysticism” and believed in signs and portents. In August of 1960 she predicted that Donna, the huge hurricane of 1960, would strike Ramrod. It did just that on September 9th. About all one could say about Ramrod Key until the 1950s was that “a road ran through it.” Neither Henry Flagler’s famous Overseas Railroad nor the auto road seemed to have much effect on life here. The railroad was a straight run through the Keys, operating from 1912 until the giant hurricane of 1935 crippled it fatally, and it was replaced by Highway US 1 in January of 1938. 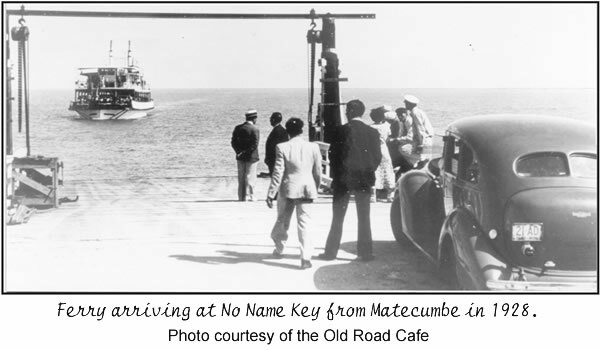 But the earlier 128.5-mile auto road through the Keys, which opened in 1928, was more idiosyncratic: it ran from Miami only to Matecumbe, where one took a 40-mile ferry ride to No Name Key ($3.50 - $6.50, including dinner), then across the Old Wooden Bridge to Big Pine and across Watson Boulevard, thence by bridge and road across to the Torches and Ramrod before continuing to Key West. Residential development of Ramrod started north of the present US 1 in the later 50s. By 1959, a grid of roads had been constructed in the middle of north Ramrod and some development had taken place on the west shore. 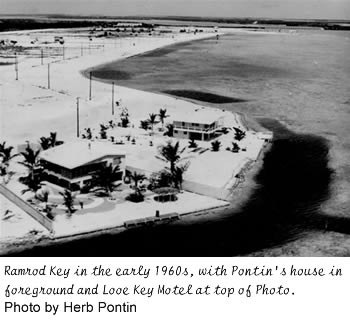 The Looe Key Reef Resort Motel was being built by Max Bennett. But Breezeswept Beach Estates was still only a vision in the mind of developer Richard Jaffe. In 1959 Jaffe was busy buying up the land (under mortgage from Neil Knowles), getting permits, and creating a “Declaration of Restrictions” (filed December 30th, 1959). Land clearing, reclamation and construction began in 1960 when Jaffe brought in work crews, heavy equipment and dynamite, and began construction of the canals. He envisioned a village of up to 3,000 people! Eddie (“Captain Eddie”) Williams surveyed the Breezeswept subdivision for Jaffe and laid out the canals. He was hired because he had one of only two survey transits in the Keys. He said that after the survey lines were drawn an explosives expert from Miami (Lonzo Coffin) came to Ramrod to drill holes within the canal boundaries, maybe five at a time, and then load each with three sticks of dynamite – BANG! Then the draglines came in and dug out the loosened rock and marl. This material was used to elevate the lots Jaffe was building (about 612 in total) on top of the mangrove and scrub covered lowland. When completed, the lots were scarcely more than 2½ feet above sea level. Most required additional fill before houses were built. Lots sold for $1,490 – $25 down and $25 a month. Taxes ran about $5 per lot per year. It was a bootstrap operation. Jaffe borrowed large sums and paid his crew partly in lots rather than cash. The roads were dirt; water came through a surface pipe. The first houses, built as demonstrators in 1961 and 1962, were those at 281 and 951 West Indies Drive, one at each of the island’s two open water points. For these, Jaffee dredged shallow channels into Newfound Harbor for boat access. A single deep canal was built at the southern end of Ramrod to connect the whole canal system (the mile-long main canal and 16 side canals) to the harbor. More information about the canals can be found in The Future of Our Canals. In the 1960s rattlesnakes were abundant and worrying residents. So a Mr. Louis Lowe with help of the “Fire Brigade” took charge and burned off numerous lots and shot the snakes as they fled the fire. By 1973, there were 53 houses on Ramrod Key, and Jim and Elaine Moore were building the Chevron station and store. The water supply came to us through a small unburied pipe snaking along the roadside. In 1981 we had about 100 houses and by 2001 about 290 houses, with several new ones under construction. Today, all modern utilities are now available. The County cooperates well with BBECA on maintenance of streets by the Roads Department and provision of security by the Sheriff’s Department. In the summer of 1962 Warner Brothers were filming PT 109, the saga of Jack Kennedy as a PT skipper in WWII, starring Oscar-winner Cliff Robertson. 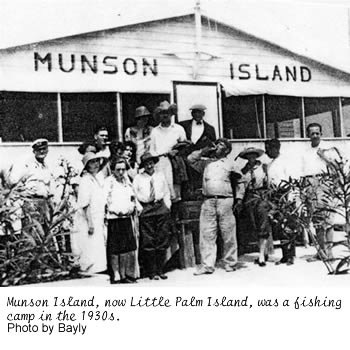 Much of the action took place at Little Palm Island – then called Sheriff’s or Munson Island and owned by John Spottswood, who was County Sheriff at that time. To create a village look, Warner Brothers built many shacks and planted palm trees. Other action was filmed around Newfound Harbor and the smaller islands like Picnic and Bird. 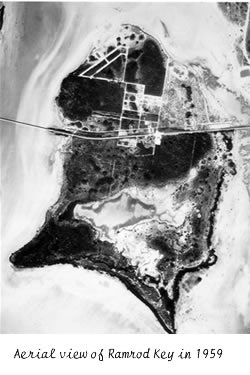 The old dredged harbor on the west side of Ramrod Key, near US 1, was the logistics base for the film crew. This harbor and Little Palm were owned by the Spottswood family, who facilitated the filming in many ways. 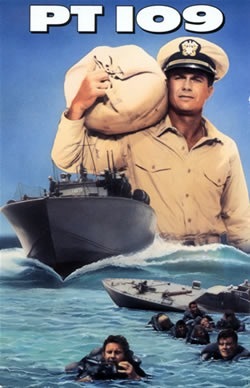 Local boatmen piloted PT 109 during all the action except when there were close-ups of Cliff Robertson at the helm. John Spottswood, dressed in Navy garb, piloted one of the other PT boats. Because PT 109 was filmed during Kennedy’s administration, cooperation from the Navy in furnishing ships for the movie was easy – a destroyer from Key West participated along with three air-sea rescue boats converted to PTs. But Warner Brothers found it necessary to publicize locally that the destroyer and other ships were here for the movie, not for another Bay of Pigs type invasion. The movie was released in 1963, five months before Kennedy was assassinated. BBECA owns a video tape of PT 109 which is available to members. Cliff Sawyer was 15 in 1962 when Warner Brothers rounded up members of his “Graveyard Boys” in Key West to work for $11 a day from June until September. 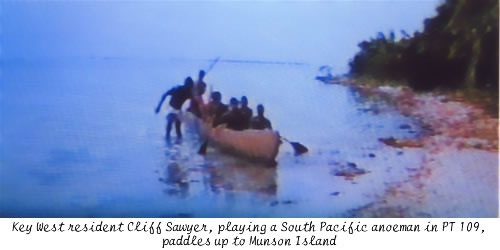 Cliff was selected for several roles, which meant he had to take a Greyhound bus at 5:30am every day to get from Key West to the crew base on Ramrod, and then catch the special boat to Little Palm. Little Palm were actually surplus AT-6 navy trainers fixed up for the job, including painting the Japanese rising sun emblem on their wings. One old twin-engine Cessna, dubbed the “Bamboo Bomber” was also used in the film. All of the planes were parked at the Marathon Airport. The aerial bombing effects were actually created not from bombs dropped from the sky, but from explosives planted on Little Palm Island and in surrounding waters, where they killed thousands of fish in the process. Cliff is now a commercial fisherman and a professional vocalist. His specialty is singing traditional ballads. He tells of soothing the PT 109 movie stars at Little Palm Island forty years ago with his ballads, the same ones he now sings to resort guests on Saturday nights. A disabled Vietnam vet, Cliff also provides spiritual guidance to prisoners at the Big Pine Key Road Prison. We wish to thank historian John Viele of Cudjoe Key for all his help in providing much of the historical information. John is the author of three books on Florida Keys history, published by Pineapple Press and available at local book sellers. Thanks also go to Tom Hambright, historian at the Key West Library, for his generous assistance. For more historical information on the Florida Keys, visit the Mile Markers web site, www.mile-markers.org.